Family vacation is something that we always look forward to. However, when it comes to meal times, this sometimes can be a major headache, as each has his/her preferences, for example one eats only seafood, while the other strictly steers clear from seafood. It is true that food courts or hawker centres (the term for more casual, semi-outdoor canteens in Singapore) are the easiest and fool-proof solutions that can satisfy everyone with the array of choices. But what's the point of eating together if we have to pay the bills separately? It was double challenging for our group, because we had my 9-months old baby niece. We had to find a convenient and non-smoking place to eat, that serves rice porridge to feed baby. As we were strolling inside Cineleisure at Orchard, I suggested that we eat at Xin Wang, most importantly because they serve congee. 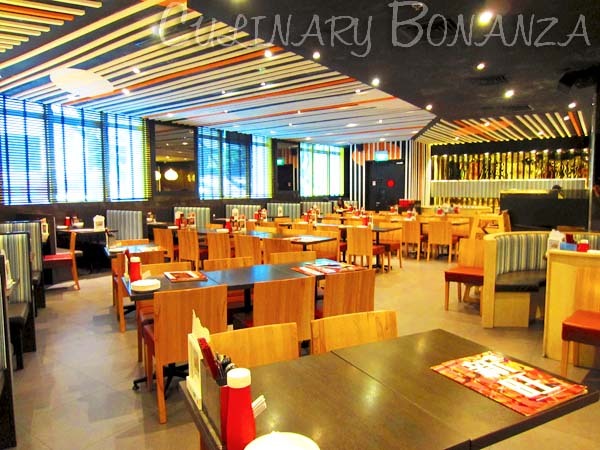 Xin Wang Hong Kong Cafe is a Singapore franchise restaurant that has 15 outlets spread across the little red dot island and overseas (the Philippines and Vietnam). 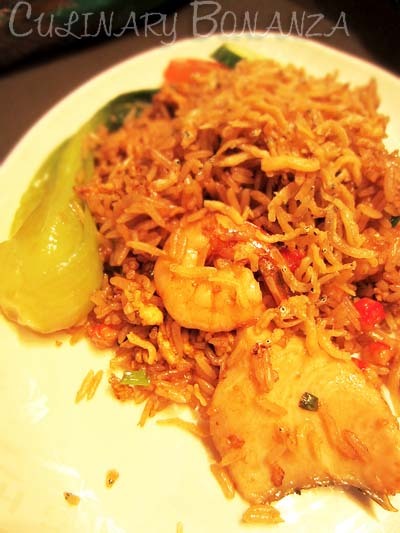 As the name suggests, it offers mainly Hong Kong dishes, but they have a variety of other types of food & drink as well. The menu & price at Xin Wang seemed reasonable and the menu is really diverse, so each of us could find what we liked. Here, you can find classic Western food, Cheese-Baked Rice, French Toast, Chicken Curry, Fried Rice, Hong Kong Chili Noodles, Yau Ma Tei Chicken Rice, Kopitiam Beverages, Snow Ice, Glutinous Ball Dessert, Papaya Soup Bee Hoon, Noodles, Congee (Porridge), Sweet Buns (a.k.a. baos), etc. It was lunch time but the outlet was virtually empty, most likely because it was on a weekday. When we returned later at night around 11PM, the Cafe was actually packed! These people must have come out of the cinemas and were enjoying their supper. 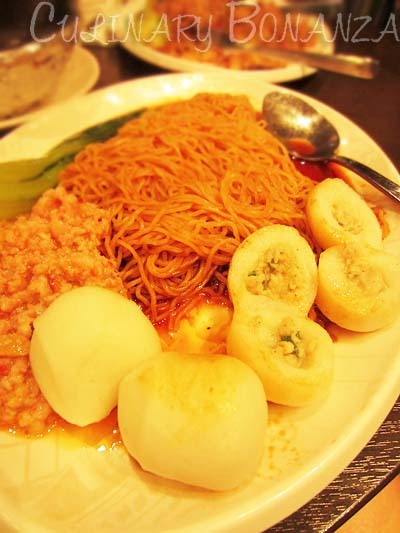 Fu Zhou Fishball Chili Dry Noodles: fine hong kong-style noodles with creamy minced meat and fishballs with minced meat filling, seasoned with brown sauce. The brown sauce was more on the sweet side, I reckon it could use more salt. Yau Ma Tei Chicken Rice. Yau Ma Tei is a name of an area in Hong Kong. 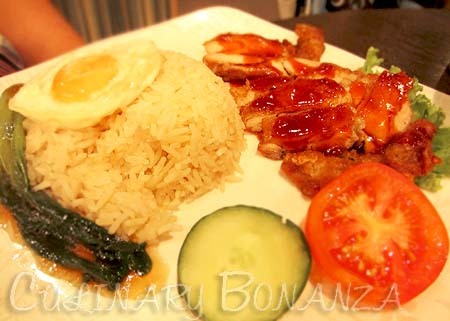 The chicken rice comes served with a sunny-side up fried egg (quite unusual for chicken rice). The sauce of the roast chicken was tasty. The Plain Congee had no seasoning apart from the natural flavours from cooking the yellow pumpkin, braised ground nuts and fresh sliced leeks and spring onions. 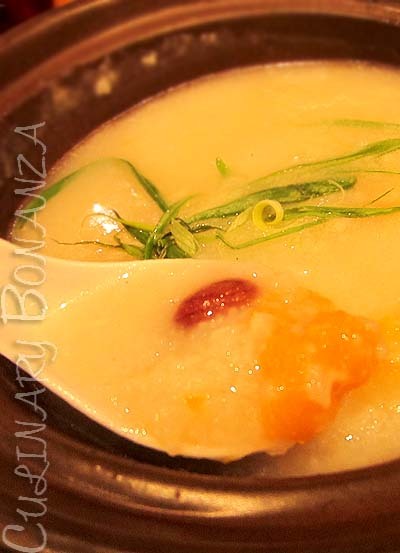 Congee is different from porridge in that congee no longer has the separate texture that the constituent ingredients have. They're cooked until these break down and become a viscous and consistent semi-solid. Suitable for babies and my niece seemed to enjoy her healthy lunch. The only turn off was the Fish Fillet Spaghetti. 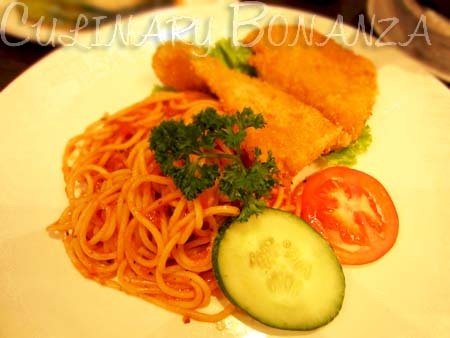 The pasta was over cooked and the fish fritter was just average, and the tomato sauce didn't make it any better. This western dish was a failure at best. I can only advice that when eating at a place, order the signatures or the best seller items, instead of things that you can find generically at other places. Ordering western food at a HK establishment would never occur to me, unless I am truly desperate and can't find anything else to eat. Rather surprisingly, my Mum liked the Xin Wang Signature Fried Rice, stir-fried with prawns, fish chunks, crab-stick bits, sotong and crispy salted anchovies. The egg was very fragrant and not too oily. It was surprising because she's very picky, especially when eating out. I rarely come across yuzu orange nowadays, so when I saw it on the drinks menu, I orderedd the Iced Yuzu Tea (SGD 4.80). Yuzu is a type of orange that origins from East Asia (Japan-Korea-China triangle). It has a rather sweet and aromatic tangy scent. I even picked the yuzu marmalade bits until the last piece! Love the bits as they're not bitter at all & it refreshes the mouth. Empty during the day, fullhouse at night!